The holy grail of rose developers has long been the blue rose. While purple roses are not quite the same thing, they are getting closer to the desired shades every day. For fans of purple flowers, there are some spectacular specimens that have been developed in the past few years. From lavender to grape, there are enough purple rose varieties to fill an entire garden. Ebb Tide is a floribunda rose covered in very deep purple flowers that open to over three inches wide. They have an intense clove scent. The plants grow to an average height of four feet, and were developed in 2006. Midnight Blue is a shrub rose with dark, blackish-purple blooms set on yellow stamens and bright green leaves. The shrub is rounded and fits nicely into smaller spaces. The scent is very strong and spicy, reminding one of cloves. The Enchanted Evening rose is a lighter lavender color, and goes well in bouquets with darker purple roses. This is a floribunda rose that has a darker center with silvery edges. The scent is citrus-like. The Burgundy Iceberg rose is a floribunda with true double flowers. The blooms have a pink underside with a deep purple center. The scent is reminiscent of honey. This variant is a native of Australia, and should be trouble-free in zones 5-9. Remove water sprouts and suckers. These are thin, fast-growing shoots. Water sprouts grow from branches; suckers grow from the soil at the base of the tree and sometimes from the lower trunk. If the shoots are small you may be able to use your hands to snap them off. Otherwise, use pruning shears and cut them completely off. Cut away all dead, damaged and diseased wood. Look for branches that are crossing over others and prune those off. When pruning, cut the branches back to their points of origin. Use lopping shears or a hand saw to cut thick branches. Remove all pruning detritus from the area and water the tree at the rate you normally provide, immediately after pruning. Choose a planting location in the fall, prior to the ground freezing. Plant the purple sensation allium in full sunlight or partial shade. It prefers well-draining soil. Plant the purple sensation allium bulb approximately 3 to 6 inches deep. Allow the top, pointy end of the bulb to protrude halfway out of the soil. Firm the soil around the bulb. Space the bulbs 10 to 12 inches apart to allow ample room for the plant to grow. Moisten the soil around the bulb after planting, but abstain from watering during the winter months. Keep the purple sensation allium bulb moist in the spring months. Apply a slow-release, general purpose fertilizer around the plant in the spring. Follow the directions on the fertilizer's label for application instructions. Examine the foliage's color and shape. Barberry has small, oval reddish-purple leaves. Judas tree has large, oval purple leaves, pointed at the ends. Purple-leaved elder has long, narrow grayish-purple leaves. Purple ninebark leaves are deep black-purple. Smoke bush, purple-leaved plum and purple-leaf sand cherry have elongated oval leaves. Purple-leaved hazel has oval leaves with a crinkled texture. Inspect the shrub for flowers in the spring and summer. Tea tree has small white flowers. Barberry produces yellow flowers. Purplenine bark has large light pink flowers. The purple-leaved plum and purple-leaf sand cherry have white-pink flowers, similar to those found on fruit trees in spring. Examine the growing habit of the shrub. Tea tree has a stiff, erect form. Barberry has a somewhat sprawling, rounded form. Purple-leaved plum and purple-leaf sand cherry have a mounded form while purplenine bark and smoke bush have an upright tree form. Perform a pH test on the soil where you intend to plant the purple coneflower seeds, using a soil pH tester available at your local garden center. 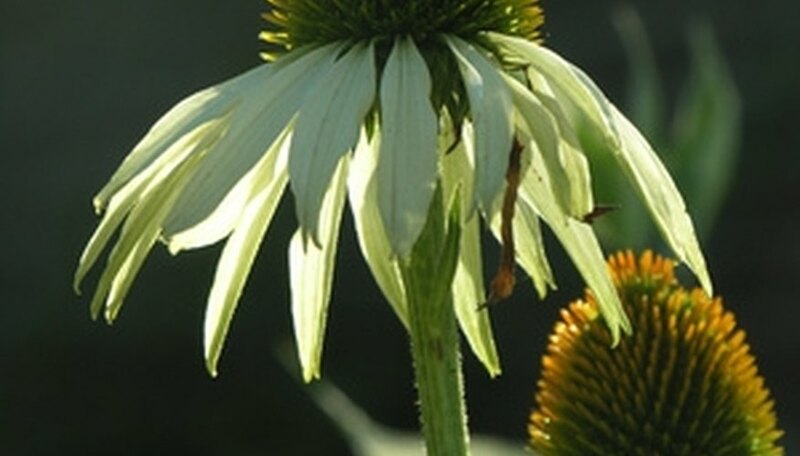 Purple coneflowers prefer an acidic, slightly alkaline soil with a pH of 6. Loosen the soil with a shovel or a spade to a depth of 18 inches. Add lime and sulfur amendments to the soil, as indicated by the pH tests, and rake into the planting bed. Press the purple coneflower seeds into the bed with your finger at a depth of ? inch. They do not need to be planted very deep, as they often grow in the wild from scattered seeds. Space the seeds 18 to 24 inches apart. Water the seeds immediately, and keep slightly moist during germination. This process will take between 15 and 30 days. Choose the site where the coneflowers will grow. These plants do best in full sun and well-drained soil. Amend the soil in the area where the coneflowers are to be planted. Turn over the soil and add compost. Sow seeds directly in the garden in the spring. The soil temperature should regularly be at least 55 degrees. Scatter the seeds over the flower bed and cover them with 1/4 inch of soil. Water the coneflowers regularly. When the weather is dry make sure they get about 1 inch per week. Thin the seedlings after they emerge. Space the plants about 12 to 18 inches apart. The coneflowers will grow to be between 2 and 4 feet tall. Rake around the purple plum tree in a 3-foot radius. Rake up any mulch, leaves and other debris. Rake over the area again to loosen the top 1 inch of soil. Scatter the fertilizer, at the rate suggested on the package, in a 3-foot radius around the tree. Use the rake to scratch the fertilizer into the top 1 inch of soil. Water the soil until the top 4 inches is moist. This will help activate the fertilizer and allow it to seep into the soil. Place purple roses in an area with full-sun for at least six hours a day with some afternoon shade. This will prevent water from resting on leaves, causing black spots. Plant roses in well-drained, loose soil with a pH range of 5.5 to 7.0. Test your soil for pH levels. Add any necessary amendments to the soil to establish the correct pH range. Add 2 to 4 inches of organic matter, such as peat moss, manure or humus, to a depth of 12 inches to provide nutrients for purple roses as well improve drainage problems. Ensure that the roses get 12 to 18 inches of water weekly. Prevent water from splashing onto the foliage by watering with a soaker hose around the base of the rose bush. Apply a 2- to 4-inch layer of organic mulch, such as shredded bark and pine needles, around the purple rose bush, leaving space around the base of the rose. Fertilize with a rose food fertilizer such as 10-10-10. Apply once before roses bloom and again in the middle of their bloom season. Apply 1 cup of fertilizer around the base of the rose bush, without touching the stems, and water it in well. Fill flower pot half-full with potting soil. If the pot does not have drainage holes at the bottom, create drainage by filling the bottom of the pot with rocks or pebbles. Gently take the heliotrope plant from its starter pot and place down into the potting soil. Cover the base of the plant with potting soil. Use enough potting soil so that the roots of the plant are covered and the plant stands up straight. Water the plant thoroughly. Heliotrope prefers moist soil and should not be left to dry out between waterings. Place heliotrope in a sunny window. The flower needs full sun to bloom. In addition, make sure the plant is away from drafty windows, where temperatures may dip below 70 degrees. Feed the heliotrope a traditional amount of plant food after it has become established in the pot (according to the directions on the food's packaging). Generally this occurs within two to three weeks. During the growing season, continue to fertilize your heliotrope regularly according to directions listed on your fertilizer.